In the unlikely event anyone else is unclear on this, here is some information: The "Electoral College" is not an actual college. Nor is it a university or school or, in fact, a learning institution of any kind. It is not a government agency. It is not a corporation or any other sort of business entity. It is not a person, legally or otherwise. It is not even a single group of people: its members never meet in one place. There are meetings of state "electors" but there is no meeting of the "Electoral College." It is not a thing. And so you cannot sue it. Certainly the Electoral College is mysterious to most of us in some ways, and there are details you wouldn't know unless you looked them up like I did. In the U.S. we don't elect the President directly. Each state appoints a number of "electors" equal to the number of its representatives in Congress. The electors cast votes and Congress counts them to determine the winner. Electors almost always vote the same way as the majority of state voters did—in some states, it is illegal for them to vote differently, but no one's ever been prosecuted for it. According to this report, there have been 157 "faithless electors" over the years, although 71 of them switched only because the original candidate died after the election, which seems like a pretty good reason. This has never affected the outcome of an election, although it conceivably could have in 2000, for example. But not only is the Electoral College not an actual entity, the electors never even meet in one place—each group meets and votes in its home state. U.S. Const. Art. II, § 1, cl. 2; Amend. XII. Again, some of these are details you might not know, unless you looked them up, which you might possibly do if, for example, YOU WERE PLANNING TO SUE THE ELECTORAL COLLEGE. 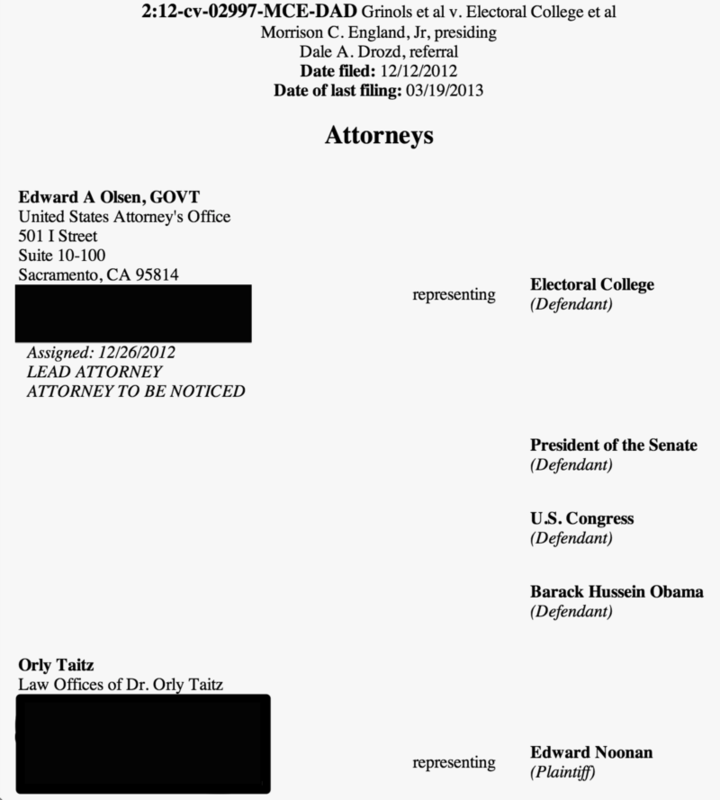 Orly Taitz, whose heroic struggle against reality I have mentioned a few times now, including when she tried to sue me and the President and worst of all the Postmaster General, has also been litigating in the Eastern District of California (among many other places). As always, even if she is suing for some other reason (like losing the California primary), she always ends up portraying that event as part of the larger conspiracy to suppress the fact that Barack Hussein Obama is not a "natural born citizen." And this case was no exception. It is also not an exception to the rule that she has lost every time. Taitz, who for some inexplicable reason is licensed to practice law in California, did not represent herself as she often does but rather found some nominal plaintiffs. I don't know if any of them showed up for hearings, but I'm pretty sure Keith Judd didn't, because as it says in one pleading, he is "currently serving a 210-month sentence for extortion." The defendants included, in addition to aforementioned miscreant Barack Hussein Obama, the U.S. Congress (all of it) and as noted, the "Electoral College." Which is not a thing. The Electoral College did "appear" in the lawsuit, in the sense that the U.S. Attorney's office included "it" on the list of parties. Prediction: Taitz will interpret that as evidence that the Electoral College is a real entity, so if it existed, its legal troubles might not be over.